Zimmer and Peacock are different in the way we exhaustively characterise, analyse and functionally test our sensors. Potentiometically investigating the reference electrode. 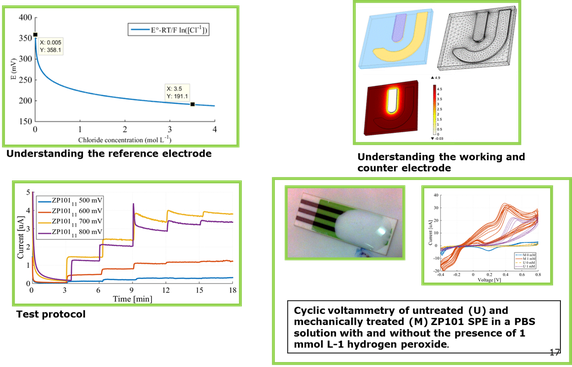 Using multi-physics finite element modelling to characterise a working electrode. Investigating sensitivity of a sensor as a function of poise potential. Electrochemically analysing a sensor using cyclic voltammetry. Zimmer and Peacock is unique in that over 20 years of director experience in sensor development, backed up fully functioning laboratories and our ability to manufacture the output of research or trouble shooting effort. Please browse our website or contact us directly to understand our skills in: sensor development, sensor manufacturing, sensor trouble shooting, software, design engineering, productization of ideas.